Excerpted from the Summer 2018 edition of Communities, “Eco-Building”—full issue available for download (by voluntary donation) here. Ionia is a cooperative ecovillage located on 200 acres of spruce forest on the Kenai Peninsula in Alaska, created in 1986 by five disenfranchised families with members who experienced emotional traumas navigating modern times. The founding families met each other in the movement known as macrobiotics, and we had that love of simple plant-based foods in common. Coming from the large Boston-based macrobiotic community (our grandparent) we also all had a sense of human beings being part of natural forces, part of an infinite universe just like other natural phenomena; we were and are attracted to non-human-centric points of view. This is part of the foundational ethos of Ionia. All of the original families received SSI disability benefits which barely paid the bills in the city. In our humble beginnings, we bought 10 acres of flat muskeg-covered land on the Kenai Peninsula, built a road, dug a well, and put up five tipis. For $500 down and $300 per month, we had a beginning. As one of the founding mamas, I felt happy and safe in our own little paradise in the making. It was a cold, snowy winter that year but we were cozy in those tipis: the kids ran around in the spruce forest and we cooked on wood stoves which we kept cranking 24 hours a day. We began to talk with each other daily in morning meetings, pool resources, and attempt to create a culture of trust, imagination, tolerance, and cooperation: we felt that “Shared sorrow is half sorrow and shared joy is double joy,” a wise Swedish proverb. Ionia has evolved over the past 30-plus years to become a bustling little village. Our kids have grown and gone off to explore who they are in the world, and many have returned to raise their own children as part of our endeavor, so now third-generation babies and toddlers are running around laughing and screaming. We have had 16 babies born in the last four years. Ionia is primarily a community of families, and our year-round population hovers between 40 and 50, of all ages and abilities, from newborns to elders. Many people join us in the summers to learn, help out, and sometimes to heal. Spending time at Ionia is definitely a commitment of attention, reflection, and change. We are trying to create a way of life which embodies more social and environmental justice than modern times’ usual alternatives. We mill spruce logs to build homes and furniture, and grow and cut firewood. Organic gardens, greenhouses, and a grain field help to feed us throughout the year. We share resources and pool strengths, providing an umbrella for all. We partner with local social service organizations, the State of Alaska Division of Behavioral Health, and the college to provide wellness and recovery training for people on the Central Kenai Peninsula who experience addiction, trauma, and emotional imbalance. Our activities usually always encompass macrobiotics, or whole foods for whole health, peer support and close family support, and simple, seasonal activities based in the natural world. Building with natural materials is a great fit for this community: we hope to live lightly on this pristine Alaskan land…plus natural buildings often need many hands. In the first 10 years, the residents joined together to build 10 beautiful log cabins: first, five 1,400 square foot family homes, then five smaller cabins of various sizes as our kids grew up and more families moved in. In the beginning, we built the traditional Alaskan way with logs, and heated with wood stoves. We created our own design process, which is easy in rural Alaska where building permits are not an issue. All our cabins have open floor plans, on-demand propane hot water, and outhouses. The long summers of daylight are our building season. Log building relies heavily on people with strong arms to lift logs. In our community, the women and children peeled logs every day for weeks and weeks all summer long. The guys mostly lifted purlins and wall logs into place, and everyone hammered the roof boards on. My young children learned to cook whole meals in that first summer, by necessity, as we built and built. When we moved into my family home, my kids dumped sand in the middle of the living room floor without a second thought because they were so used to living outside! The cabins have housed numerous people over the years, and they continue to be a strong comforting presence, demonstrating the amazing beauty of nature, the financial and creative power of community, and a balanced mix of individual expression with community norms and neighborhood planning. However we needed more housing. As the pressure to have a true common space finally boiled over, in 2001-2003 we gathered our strong young men and women, and all our experienced builders together to design and build a 12,000 square foot log community center, which was named the Longhouse. The Longhouse has a large and comfortable meeting room where we can gather in circle meetings, an administrative office with computer access, a music corner with many instruments, a sewing corner, plenty of space for private corners and storage, and a community-size kitchen, pantry, and root cellar. Ionia is known for its delicious, wholesome cooking; fermented foods such as miso, sauerkraut, kimchee, vinegars, and tempeh, plus sourdough breads, sugar-free desserts, and jams, are all made from scratch in the community kitchen. The Longhouse is also where our morning meetings are held; it has a home-schooling circle for its youngest residents; we celebrate monthly full moon celebrations and holidays there; we let the youngsters run around together; and it is home to many, many conversations, therapies, planning meetings, sewing and art projects, classes, music jams, and other happenings in village life. It is also a way for the larger surrounding community to interface with Ionia, and has been the beginning of a more open era for us. For example, we began to have public cooking classes—and I learned to teach. The Longhouse has huge log trusses which sweep across grand high peaked ceilings, wood floors, log post and beams, and log walls, as well as majestic soapstone masonry heaters which save us firewood and give us steady hours of cozy gentle warmth. The masonry heaters are of Northern European tradition, designed by Albe Bardon of Maine Wood Heat Company especially for this space, and built by a team of masons from all over the country. It was a sight to behold as they were built, and gave me so much respect for the all but lost art of masonry work. When they first agreed to build these massive stone heaters, they had some requests: a home to stay in on the property, and a build site that was roofed over, dry, and warm. Well, as they were arriving, we were rushing to hammer on the roof boards—literally as they set up to build, the roof was closing up. It was September and getting chilly, so it was dicey but we did it and the masons were quite gracious. They bunked all together in a log cabin, ate macrobiotic meals, and had never experienced such rustic and peaceful surroundings, full of wild children and wild eagles. The Longhouse was another log building; there were miles of logs to peel and place, and every course of logs gave us new excitement and a feeling of accomplishment. We knew this method of building, yet as we have seen over the years, logs are lovely but not great insulators. The six inches of log is a poor keeper of heat, not to mention the many cracks between the logs. So when it came time to plan the next big project—the “Barn” as we have come to call it—we were perplexed as to what materials would be best suited. But what to build it with? Our first idea was a basic post and beam skeleton, wrapped in Structural Insulated Panels (SIPs), billed to be super energy efficient and cost efficient. OK, so that was the plan…we hired an architect this time, to satisfy some of our grant funders, and created a modern design pleasing to all. It has a north overhanging roof for outside vehicle parking, huge southern roof for future solar panels, plenty of windows, and another open floor plan. In 2008 construction commenced, with unique steel foundation posts, thick wood flooring, the first posts and beams. But wait, somewhere along the way, we had a series of discussions and decided we might need to switch to logs; maybe we couldn’t live with the “ka ka” (made from oil) building materials no matter how “green” (energy efficient) they may be. But then, one of our young men spent a winter volunteering in Mexico, where he helped to build with straw and mud. He called, super excited, and said that this was it—this is how we must build the barn. Whoops, we might have a change of plan! We had to stop and think, frustrate the architect, spend more money we didn’t have on his time, have mad planning meetings in the middle of the barn construction site, and finally—after much debate—decide that yes, this really did sound like a fitting alternative more in line with our values and more exciting to explore. This was a very backwards process and not recommended, but there you have community life, with all its complications and unknowns. Luckily, homemade natural buildings are more suited for this kind of redesign-and-rebuild-as-you-go kind of organic process! The barn has been a learning curve from the beginning. Luckily, our architect is a patient, creative, flexible man with vision. He was able to dance with Ionia’s group process and found a way to communicate our changing plans successfully with the fire marshal and permitting entities. This was a huge boon to us. We researched, found some strawbale and straw/clay homes in Alaska, and traveled to talk with the builder-owners. It seemed to us that in our wet cold climate, strawbale has the best insulation value hands down, but it had other drawbacks: rodents enjoyed building their nests in straw in the long cold winters; and any rain or snow that found its way in created big mold issues. In our buildings, which are heated with firewood, and must withstand months of rain and snow, we started to look more seriously at the light straw-clay alternative. Straw and clay creates a wall which is fireproof, thick and insulative, and hydroscopic—which means it can breathe, and wants to let in and let out moisture as it breathes. This means that no moisture barrier is wanted! This was a whole new concept, and quite welcome. It also means it needs a good hat (low overhanging roof) and good boots (dry and high foundation which keeps the walls off of the ground). The walls can be load-bearing or not, but it makes a gorgeous combination with load-bearing timber frames. There are many traditional and recently improved versions of building with straw and clay, from cob to adobe, but in our cold and wet climate, the method which makes the most sense is known as light straw-clay. Our local Kenai Peninsula clay is perfectly suitable; dry baled Delta Junction straw is readily available. 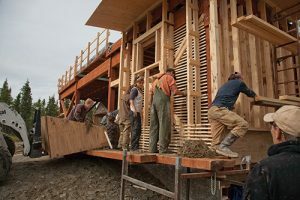 In the summer of that same year, our main building crew drove to Salt Spring Island in Canada for a three-week intensive natural building workshop called Econest. This exciting workshop connected us to the big wide world of the natural building movement and covered the basics of clay/straw and timber frame construction, combining lectures with practice. Returning as an inspired force, the building commenced in earnest. We found a local natural builder to apprentice with, Lasse Holmes of Canyon Arts Natural Building in nearby Homer, who has helped us create a building system and style which supports all of us working together. Lasse has been an invaluable resource. With his help, we built from scratch a mechanized system for the production of straw/clay insulation and clay plasters. We found parts in junk yards and neighbor’s back yards and fish packing plants to put together an efficient user-friendly production line which includes storage tanks and settling tanks, clay slip mixers, and a straw/clay mixer/tumbler. The Ionia sawmill is an integral part of this production line as well, and most of the posts, beams, and boards in the barn structure have come off our own mill. This has taken more time than expected but is enormously satisfying. In fact, all aspects of this way of building seem to take a long time, we are finding out. Each summerʼs work has been accomplished by setting up a “train” of crews: each crewʼs daily tasks allow the next part of the train to move, and each crewʼs work depends on the last. The crews consist of saw millers, carpenters, clay processors, clay slip makers, straw fluffers, straw/clay insulation mixers, form builders, straw/clay stuffers, and plasterers. And this is Ionia, where we are all about the food, so don’t forget the snack makers! Everyone, no matter age or ability, can get involved and get trained up in most of the tasks. It’s been a great way to enjoy our collected energy, all summer long for many summers. The barn now has been home to many natural building workshops, including rocket mass heater, timber framed bridge, and clay plasters. The staircase up to the cupola is the crown jewel, sweeping up in a square spiral of local wood. It was built as the last creation of one of our founding fathers, who died last spring. The barn is his legacy, along with countless other builders. Master craftsmen have created doors that will last several lifetimes, and the clay walls breathe with you as you work, creating a nourishing fresh environment. Within this process of building, we have confirmed and reconfirmed that simple hands-on collected natural activities are foundational to our way of life. Building the barn provides a tangible, accessible pathway for many residents to be involved in a community process; to learn new skills; to be drawn in by the teamwork approach and by the natural materials themselves. The barn has connected Ionia to the larger natural building movement in Alaska, the lower 48, and all over the world. It has been an epic nine-year journey and has changed the pace and tone of our community quite a bit: it has brought in curious builders and volunteers from Taiwan, Japan, Europe, South America, other communes, and all over Alaska every year. A handful of our residents have been inspired to travel to other builds, and are planning homes here made from straw and clay. I feel we will always be building now—first to finish the barn, then to build homes here at Ionia, then onwards to homes around us in Alaska. Eliza Eller lives on the Kenai Peninsula in Alaska at the village of Ionia (www.ionia.org). She spends her days growing food in the summers and carrying firewood in the winters, soaking in the arctic sun, organizing events and trainings, cooking, keeping in touch with her growing family, and scrambling to keep up with the ever moving generations of change at Ionia. She hangs out around guys who love building with clay and straw, and it is catching, so on a warm summer day, if she isn’t weeding in one if the many greenhouses, one might find her, covered with clay, madly mixing a barrel of slip. For more information about volunteer opportunities this summer on the Ionia Barn Project, write eliza [AT] ionia.org or call her at (907) 252-2314.